These sample racks are designed to fit into the SS200 Sample Saver™ for the storage of TEM grid boxes or aluminum stubs that needed to store in safe environment. The Gatan storage box has been developed to store 28 of the Gatan 3View pin stubs. Made from clear polystyrene, it has two hinges and a snap-lock. 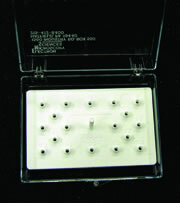 Pins are held by a custom high density closed cell NBR foam with holes. The high density closed cell foam doesn't crumble and is elastic enough to allow repetitive loading and retrieving of the pins. Outside dimensions: 120 x 84 x 36 mm. Please see Gatan 3View® Pin Stubs here. 1) Box with insert and lid; holds 4 of ½" dia. (12.5 mm) surface and ⅛" dia. (3.2 mm) pin mounts. 3) Box with insert and lid; holds 4 of 12.5mmx12.5mm mounts. 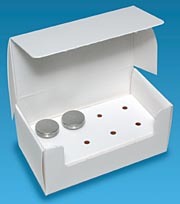 Box with insert and lid; holds 12 of 10 and 15mm diameter mounts or 12 of 3.2mm (⅛") pin mounts. 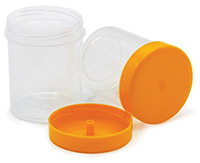 A soft silicone base in a hinged plastic box; the base has 9 cavities, each 1" (25mm) in diameter and ¼" (6mm) deep. 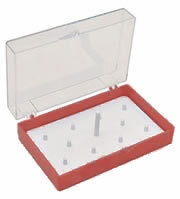 The box accommodates up to 9 mounting stubs of either 1" (25 mm) in diameter or a ⅛" diameter pin. A 15 mm Hitachi mount can be inserted securely to the plug and then protected by the tube. Ideal for storage as well as mailing. 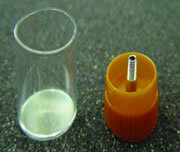 With a Pop Up box which stores up to 8 mounts: 1/2" (12.7mm) head, ⅛" (3.2mm) diameter pin. 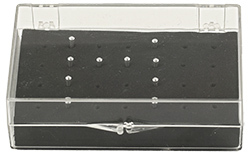 The EMS Specimen mount Box and holder is a unique storage box for Pin mounts with 3.2mm (⅛") Pins. 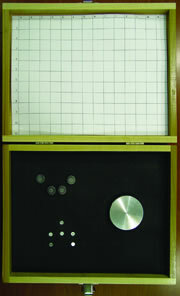 The box is numbered 1-18 and it can accept mounts ranging in size from 6.4 mm to 50 mm. With the ability to hold as follows: 18 of 12.7 mm; 8 of 25 mm; 2 of 32 mm and even 38 or 50 mm The maximum specimen height between mount surface and closed lid is 16mm (⅝").